On January 23rd, Healthy Lamoille Valley teamed up with members of our local prevention partners Vermont Kids Against Tobacco (V-KAT) to say thank you to two Morrisville retailers who recently passed their Department of Liquor Control alcohol and tobacco compliance checks. 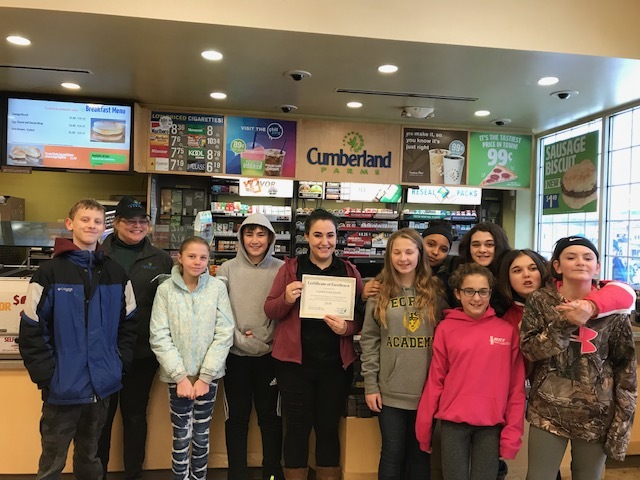 Alison Link, Policy and Community Outreach Coordinator for Healthy Lamoille Valley, and V-KAT members from Peoples Academy Middle Level visited Cumberland Farms and Tomlinson’s in Morrisville to present certificates of appreciation to the store managers and employees and to share about V-KAT and why preventing tobacco sales to minors is so important. The students also spoke with retailers about their current focus on prevention of vaping and e-cigarettes and took pictures as part of their Photovoice project (through the Vermont Department of Health). The Photovoice project is an opportunity for V-KAT youth to document the tobacco advertising, marketing, and secondhand smoke exposure they are seeing in their communities. Healthy Lamoille Valley sees our local retailers as partners in substance prevention. These visits are also impactful for the store managers and employees who got a chance to share some of their thoughts with the students. The manager of Tomlinson’s said that they do not and have never sold JUUL vaping products because of the negative impact on youth. The students were impressed by this and know there is much more to be done in limiting and eliminating the sale of flavored tobacco products that target underage users. 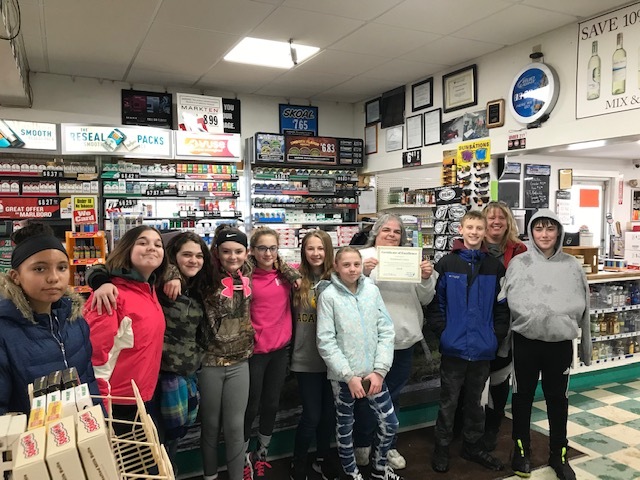 Below: Peoples Academy Middle School Students who are part of the V-KAT Vermont Kids Against Tobacco Group and store staff at Tomlinson’s Store and Cumberland Farms in Morrisville, VT.